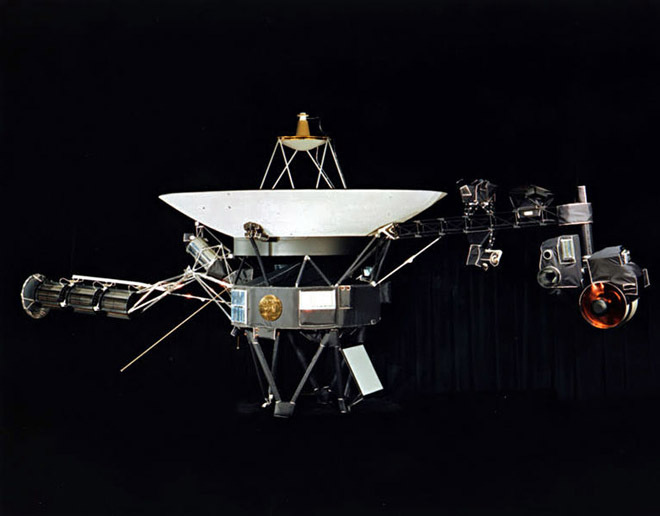 In 1977, the Voyager 1 spacecraft left Earth on a five-year mission to explore Jupiter and Saturn. Thirty-six years later, the car-size probe is still exploring, still sending its findings home. It has now put more than 19 billion kilometers between itself and the sun. Last week NASA announced that Voyager 1 had become the first man-made object to reach interstellar space. The distance this craft has covered is almost incomprehensible. It’s so far away that it takes more than 17 hours for its signals to reach Earth. Along the way, Voyager 1 gave scientists their first close-up looks at Saturn, took the first images of Jupiter’s rings, discovered many of the moons circling those planets and revealed that Jupiter’s moon Io has active volcanoes. Now the spacecraft is discovering what the edge of the solar system is like, piercing the heliosheath where the last vestiges of the sun’s influence are felt and traversing the heliopause where cosmic currents overcome the solar wind. Voyager 1 is expected to keep working until 2025 when it will finally run out of power. None of this would be possible without the spacecraft’s three batteries filled with plutonium-238. In fact, Most of what humanity knows about the outer planets came back to Earth on plutonium power. Cassini’s ongoing exploration of Saturn, Galileo’s trip to Jupiter, Curiosity’s exploration of the surface of Mars, and the 2015 flyby of Pluto by the New Horizons spacecraft are all fueled by the stuff. The characteristics of this metal’s radioactive decay make it a super-fuel. More importantly, there is no other viable option. Solar power is too weak, chemical batteries don’t last, nuclear fission systems are too heavy. So, we depend on plutonium-238, a fuel largely acquired as by-product of making nuclear weapons. But there’s a problem: We’ve almost run out. “We’ve got enough to last to the end of this decade. That’s it,” said Steve Johnson, a nuclear chemist at Idaho National Laboratory. And it’s not just the U.S. reserves that are in jeopardy. The entire planet’s stores are nearly depleted. But it doesn’t have to be that way. The required materials, reactors, and infrastructure are all in place to create plutonium-238 (which, unlike plutonium-239, is practically impossible to use for a nuclear bomb). In fact, the U.S. government recently approved spending about $10 million a year to reconstitute production capabilities the nation shuttered almost two decades ago. In March, the DOE even produced a tiny amount of fresh plutonium inside a nuclear reactor in Tennessee. It’s a good start, but the crisis is far from solved. Political ignorance and shortsighted squabbling, along with false promises from Russia, and penny-wise management of NASA’s ever-thinning budget still stand in the way of a robust plutonium-238 production system. The result: Meaningful exploration of the solar system has been pushed to a cliff’s edge. One ambitious space mission could deplete remaining plutonium stockpiles, and any hiccup in a future supply chain could undermine future missions. The only natural supplies of plutonium-238 vanished eons before the Earth formed some 4.6 billion years ago. Exploding stars forge the silvery metal, but its half-life, or time required for 50 percent to disappear through decay, is just under 88 years. Fortunately, we figured out how to produce it ourselves — and to harness it to create a remarkably persistent source of energy. Like other radioactive materials, plutonium-238 decays because its atomic structure is unstable. When an atom’s nucleus spontaneously decays, it fires off a helium core at high speed while leaving behind a uranium atom. These helium bullets, called alpha radiation, collide en masse with nearby atoms within a lump of plutonium — a material twice as dense as lead. The energy can cook a puck of plutonium-238 to nearly 1,260 degrees Celsius. To turn that into usable power, you wrap the puck with thermoelectrics that convert heat to electricity. Voila: You’ve got a battery that can power a spacecraft for decades. “It’s like a magic isotope. It’s just right,” said Jim Adams, NASA’s deputy chief technologist and former deputy director of the space agency’s planetary science division. U.S. production came primarily from two nuclear laboratories that created plutonium-238 as a byproduct of making bomb-grade plutonium-239. The Hanford Site in Washington state left the plutonium-238 mixed into a cocktail of nuclear wastes. The Savannah River Site in South Carolina, however, extracted and refined more than 360 pounds during the Cold War to power espionage tools, spy satellites, and dozens of NASA’s pluckiest spacecraft. By 1988, with the Iron Curtain full of holes, the U.S. and Russia began to dismantle wartime nuclear facilities. Hanford and Savannah River no longer produced any plutonium-238. But Russia continued to harvest the material by processing nuclear reactor fuel at a nuclear industrial complex called Mayak. The Russians sold their first batch, weighing 36 pounds, to the U.S. in 1993 for more than $45,000 per ounce. Russia had become the planet’s sole supplier, but it soon fell behind on orders. In 2009, it reneged on a deal to sell 22 pounds to the U.S.
By 2005, according a Department of Energy report (.pdf), the U.S. government owned 87 pounds, of which roughly two-thirds was designated for national security projects, likely to power deep-sea espionage hardware. The DOE would not disclose to WIRED what is left today, but scientists close to the issue say just 36 pounds remain earmarked for NASA. That’s enough for the space agency to launch a few small deep-space missions before 2020. A twin of the Curiosity rover is planned to lift off for Mars in 2020 and will require nearly a third of the stockpile. After that, NASA’s interstellar exploration program is left staring into a void — especially for high-profile, plutonium-hungry missions, like the proposed Jupiter Europa Orbiter. To seek signs of life around Jupiter’s icy moon Europa, such a spacecraft could require more than 47 pounds of plutonium. Many of the eight deep-space robotic missions that NASA had envisioned over the next 15 years have already been delayed or canceled. Even more missions — some not yet even formally proposed — are silent casualties of NASA’s plutonium poverty. Since 1994, scientists have pleaded with lawmakers for the money to restart production. 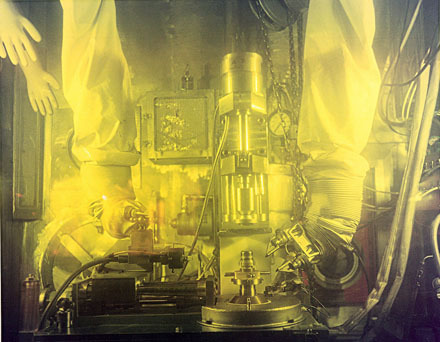 The DOE believes a relatively modest $10 to 20 million in funding each year through 2020 could yield an operation capable of making between 3.3 and 11 pounds of plutonium-238 annually — plenty to keep a steady stream of spacecraft in business. In 2012, a line item in NASA’s $17-billion budget fed $10 million in funding toward an experiment to create a tiny amount of plutonium-238. The goals: gauge how much could be made, estimate full-scale production costs, and simply prove the U.S. could pull it off again. It was half of the money requested by NASA and the DOE, the space agency’s partner in the endeavor (the Atomic Energy Act forbids NASA to manufacture plutonium-238). The experiment may last seven more years and cost between $85 and $125 million. 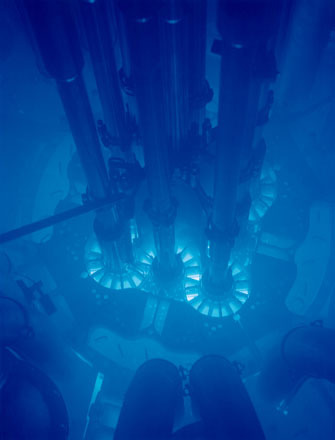 At Oak Ridge National Laboratory in Tennessee, nuclear scientists have used the High Flux Isotope Reactor to produce a few micrograms of plutonium-238. A fully reconstituted plutonium program described in the DOE’s latest plan, released this week, would also utilize a second reactor west of Idaho Falls, called the Advanced Test Reactor. That facility is located on the 890-square-mile nuclear ranch of Idaho National Laboratory. The scrub of the high desert rolls past early morning visitors as the sun crests the Teton Range. Armed guards stop and inspect vehicles at a roadside outpost, waving those with the proper credentials toward a reactor complex fringed with barbed wire and electrified fences. Beyond the last security checkpoint is a warehouse-sized, concrete-floored room. Yellow lines painted on the floor cordon off what resembles an aboveground swimming pool capped with a metal lid. A bird’s-eye view reveals four huge, retractable metal slabs; jump through one and you’d plunge into 36 feet of water that absorbs radiation. Halfway to the bottom is the reactor’s 4-foot-tall core, its four-leaf clover shape dictated by slender, wedge-shaped bars of uranium. “That’s where you’d stick your neptunium,” nuclear chemist Steve Johnson said, pointing to a diagram of the radioactive clover. Neptunium, a direct neighbor to plutonium on the periodic table and a stable byproduct of Cold War-era nuclear reactors, is the material from which plutonium-238 is most easily made. In Johnson’s arrangement, engineers pack tubes with neptunium-237 and slip them into the reactor core. Every so often an atom of neptunium-237 absorbs a neutron emitted by the core’s decaying uranium, later shedding an electron to become plutonium-238. A year or two later — after harmful isotopes vanish — technicians could dissolve the tubes in acid, remove the plutonium, and recycle the neptunium into new targets. The inescapable pace of radioactive decay and limited reactor space mean it may take five to seven years to create 3.3 pounds of battery-ready plutonium. Even if full production reaches that rate, NASA needs to squeeze every last watt out of what will inevitably always be a rather small stockpile. The standard-issue power source, called a multi-mission thermoelectric generator — the kind that now powers the Curiosity rover — won’t cut it for space exploration’s future. “They’re trustworthy, but they use a heck of a lot of plutonium,” Johnson said. In other words, NASA doesn’t just need new plutonium. It needs a new battery. In a cluttered basement at NASA Glenn Research Center in Cleveland, metal cages and transparent plastic boxes house a menagerie of humming devices. Many look like stainless-steel barbells about a meter long and riddled with wires; others resemble white crates the size of two-drawer filing cabinets. 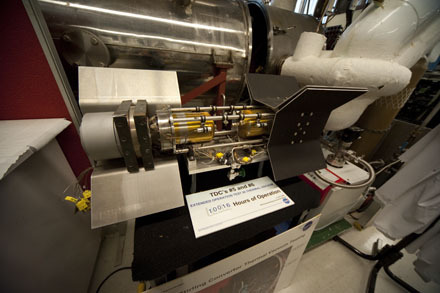 The unpretentious machines are prototypes of NASA’s next-generation nuclear power system, called the Advanced Stirling Radioisotope Generator. It’s shaping up to be a radically different, more efficient nuclear battery than any before it. On the outside, the machines are motionless. Inside is a flurry of heat-powered motion driven by the Stirling cycle, developed in 1816 by the Scottish clergyman Robert Stirling. Gasoline engines burn fuel to rapidly expand air that pushes pistons, but Stirling converters need only a heat gradient. The greater the difference between a Stirling engine’s hot and cold parts, the faster its pistons hum. When heat warms one end of a sealed chamber containing helium, the gas expands, pushing a magnet-laden piston through a tube of coiled wire to generate electricity. The displaced, cooling gas then moves back to the hot side, sucking the piston backward to restart the cycle. “Nothing is touching anything. That’s the whole beauty of the converter,” said Lee Mason, one of several NASA engineers crowded into the basement. Their pistons float like air hockey pucks on the cycling helium gas. For every 100 watts of heat generated, the Stirling generator converts more than 30 watts into electricity. That’s nearly five times better than the nuclear battery powering Curiosity. In effect, the generator can use one-fourth of the plutonium while boosting electrical output by at least 25 percent. Less plutonium also means these motors weigh two-thirds less than Curiosity’s 99-pound battery — a big difference for spacecraft on 100 million-mile-or-more journeys. Curiosity was the biggest, heaviest spacecraft NASA could send to Mars at the time, with a vast majority of its mass dedicated to a safe landing — not science. Reducing weight expands the possibilities for advanced instruments on future missions. But the Stirling generator’s relatively complicated technology, while crucial to the design, worries some space scientists. “There are people who are very concerned that this unit has moving parts,” said John Hamley, manager of NASA Glenn’s nuclear battery program. The concern is that the motion might interfere with spacecraft instruments that must be sensitive enough to map gravity fields, electromagnetism, and other subtle phenomena in space. As a workaround, each generator uses two Stirling converters sitting opposite each other. An onboard computer constantly synchronizes their movements to cancel out troublesome vibrations. To detect and correct design flaws, engineers have abused their generator prototypes in vacuum chambers, assaulted them on shaking tables, and barraged them with powerful blasts of radiation and magnetism. But NASA typically requires new technologies to be tested for one and a half expected lifetimes before flying them in space. For the Stirling generator, that would take 25 years. Earnest testing began in 2001, cutting the delay to 13 years – but that’s longer than NASA can wait: In 2008, only one of 10 nuclear-powered missions called for the device. By 2010, seven of eight deep-space missions planned through 2027 required them. To speed things up, Hamley and his team run a dozen different units at a time. The oldest device has operated almost continuously for nearly 10 years while the newest design has churned since 2009. The combined data on the Stirling generators totals more than 50 years, enough for simulations to reliably fast-forward a model’s wear-and-tear. So far, so good. “Nothing right now is a show-stopper,” Hamley said. His team is currently building two flight-worthy units, plus a third for testing on the ground (Hamley expects Johnson’s team in Idaho to fuel it sometime next year). For all of the technology’s promise, however, it “won’t solve this problem,” Johnson said. Even if the Stirling generator is used, plutonium-238 supplies will only stretch through 2022. Any hiccups in funding for plutonium-238 production could put planetary science into a tailspin and delay, strip down, or smother nuclear-powered missions. The outlook among scientists is simultaneously optimistic and rattled. The reason: It took countless scientists and their lobbyists more than 15 years just to get lawmakers’ attention. A dire 2009 report about “The Problem,” authored by more than five dozen researchers, ultimately helped slip the first earnest funding request into the national budget in 2009. Congressional committees squabbled over if and how to spend $20 million of taxpayers’ money — it took them three years to make up their minds. “There isn’t a day that goes by that I don’t think about plutonium-238,” said Jim Adams, the former deputy boss of NASA’s planetary science division. At the National Air and Space Museum in Washington, D.C., Adams stares through the glass at the nuclear wonder that powered his generation’s space exploration. Amid the fake moon dust sits a model of SNAP-27, a plutonium-238-fueled battery that every lunar landing after Apollo 11 to power its science experiments. “My father worked on the Lunar Excursion Model, which that thing was stored on, and it’s still up there making power,” Adams said. One floor up, a model of a Voyager spacecraft hangs from the ceiling. The three nuclear power supplies aboard the real spacecraft are what allow Voyager 1 and its twin, Voyager 2, to contact the Earth after 36 years. Any other type of power system would have expired decades ago. The same technology fuels the Cassini spacecraft, which continues to survey Saturn, sending a priceless stream of data and almost-too-fantastic-to believe images of that planet and its many moons. New Horizons’ upcoming flyby of Pluto — nine and a half years in the making — wouldn’t be possible without a reliable source of nuclear fuel. The Viking lander needed to dig deeper. Now we do, too. Is It Safe to Launch Nuclear Batteries? Anti-nuclear activists often state that just one microscopic particle of plutonium-238 inhaled into the lungs can lead to fatal cancer. There’s something to the claim, as pure plutonium-238 — ounce-for-ounce — is 270 times more radioactive than the plutonium-239 inside nuclear warheads. But the real risks to anyone of launching a nuclear battery are frequently mis-represented or misunderstood. Statisticians compare apples to apples by looking at a threat’s severity, likelihood and affected population. An asteroid able to wipe out 1.5 billion people, for example, hits Earth about once about every 500,000 years — so the risk is high-severity, yet low-probability. Nuclear battery disasters, meanwhile, exist as low-severity and low-probability events, even near the launch pad. Cassini, for example, left Earth with the most plutonium of any spacecraft at 72 pounds . Late in that probe’s launch there was about a 1 in 476 chance of plutonium release. If that had happened, fatalities over 50 years from that release would have numbered an estimated 1/25th of a person per the safety design of its nuclear batteries. The overall risk of cancer to a person near the launch pad during an accident was estimated at 7 in 100,000. Beyond that zone, risk was even lower. Statisticians also considered a second hypothetical and potentially dangerous event with Cassini. To get to Saturn, the spacecraft swung back toward and flew within 600 miles of Earth, zooming by at tens of thousands of miles per hour. The chance of releasing plutonium then was less than 1 in a million. If a release of plutonium occurred, statisticians estimated it might cause 120 cancer fatalities — for the whole planet — over 50 years. By contrast, natural background radiation likely claims a million lives a year, and lightning strikes about 10,000 lives. 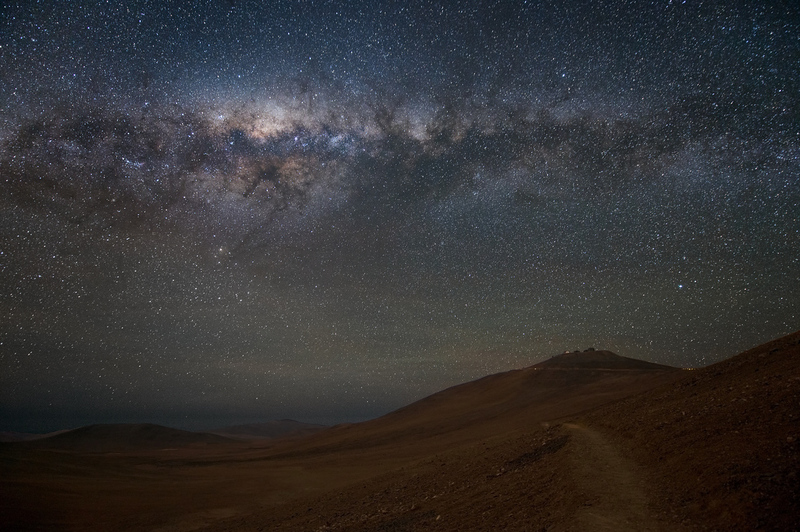 The Milky Way dominates the sky over Chile’s Atacama Desert, home to the European Southern Observatory. It’s your neck that’s the problem. Your neck is lying to you. All your life you’ve had to look up at the stars. You walk along on a summer’s evening and they’re always there, those stars, those bright mysterious points of light, waiting for you to notice, waiting for you to understand what they are saying about time and space and your own place in it all. But to see them you have to crane your neck. You have tilt back that big stone of a head to look up. Lets face it, that’s uncomfortable. And more to the point you can’t really sustain that head-craned-back position for anything more than a few minutes. That’s why the only way to really understand the real truth of the stars is to lie down. First you’ll need to find a nice place, somewhere with the darkest skies possible. It’s got to be a good place to lie down too, someplace comfortable. A wide-open field is best. Then, once you have settled down in your dark, quiet spot take a long deep breath and face out. That’s right, outwards, not up! You see “up” is just an illusion. You’re living on the surface of massive rock that’s been pulling you down with its incessant gravity since the day you were born. It’s fooled you into thinking the stars are “up” there, “up” in the sky, high above you. They’re not. Now that you are lying down, you can get to work. Imagine for a moment flattening the Earth into a thick wall. Imagine that this wall is not something below you but … behind you. You aren’t lying down anymore; you simply have your back pressed against something. And now what do you see in front of you? What do you see if you look toward your feet? And if you look to your right or your left or toward the direction the crown of your head is pointed, what’s there? Finally, we come to the real kicker. That wall your back is pressed up against, what’s behind it? There, now you have it. Now you can feel the real truth, like vertigo, as you fall into the starry multitude. These stars aren’t twinkling lights above your head, they are all suns; vast spheres of thermonuclear burning gas. And, as we have just recently come understand, almost all of those suns support their own families of planets. All those stars, all those other worlds — they’re everywhere. Now you can finally feel that you are there too, right in their midst. Time now for the second big gestalt shift, the next change in perspective. With your eyes aimed forward, focus on just one star. The sun (and its likely planets) that you are staring down lies more than 24 trillion miles away from you (a light year is about six trillion miles and the nearest star is more than four light years away). Now shift your focus and pick out another star, one that is close to the first. They look like neighbors. But that is just another deception. 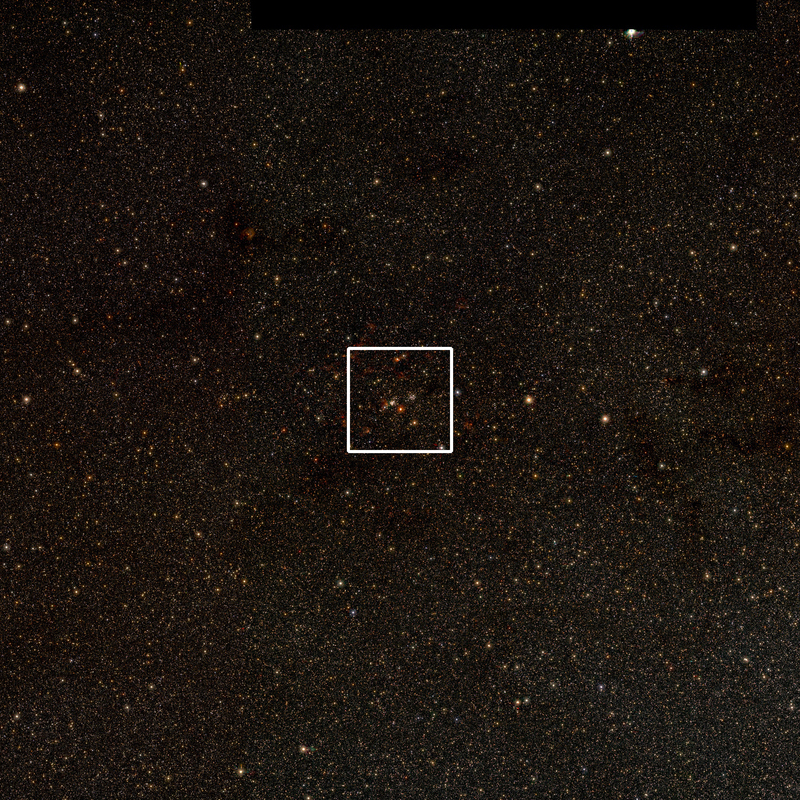 Your second star may be 10, 100 or 1,000 times farther away (or closer) than its neighbor. All those stars, all of their planets, they aren’t pressed onto the surface of a dark upturned bowl; they’re arrayed in the three dimensions of cosmic space, like fireflies scattered across a summer field. There is no up or down and you are not a resident of some city, some state or even some nation. You are not a Democrat or a Republican, a dockworker or a doctor. Right now, right at this very moment, you are a free agent hurtling through the midst of a vast city of stars, an all-encompassing architecture of suns. So remember, always face outward into the surrounding sky. Because that is your true home. MSL (Mars Science Laboratory) Style. 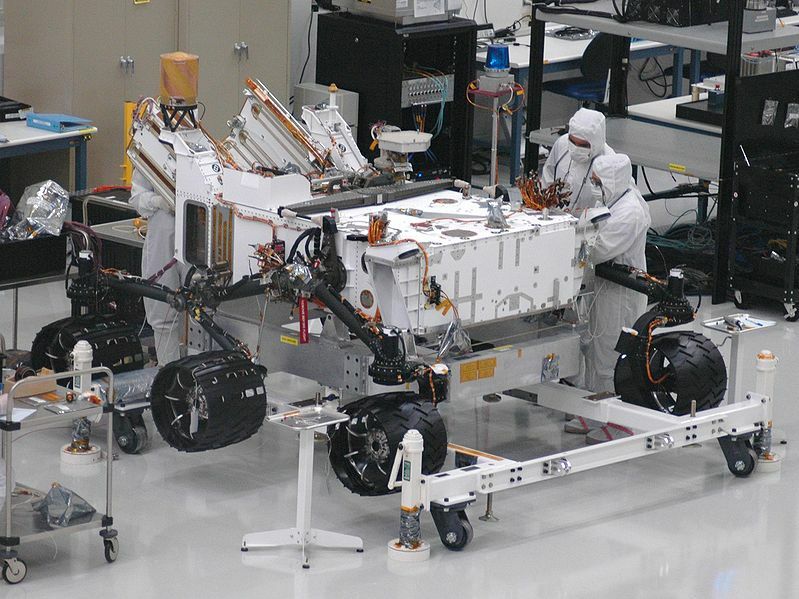 Mars Science Laboratory (MSL, or Curiosity) is a Mars rover launched by NASA on November 26, 2011. Currently en route to the planet, it is scheduled to land in Gale Crater at about 05:31 UTC on August 6, 2012. The rover’s objectives include searching for past or present life, studying the Martian climate, studying Martian geology, and collecting data for a future manned mission to Mars. Curiosity is about five times larger than the Spirit or Opportunity Mars exploration rovers, and carries over ten times the mass of scientific instruments. It will attempt a more precise landing than previous rovers, within a landing ellipse of 7 km by 20 km, in the Aeolis Palus region of Gale Crater. This location is near the mountain Aeolis Mons (formerly called “Mount Sharp”). It is designed to explore for at least 687 Earth days (1 Martian year) over a range of 5–20 km (3–12 miles). The Mars Science Laboratory mission is part of NASA’s Mars Exploration Program, a long-term effort for the robotic exploration of Mars, and the project is managed by the Jet Propulsion Laboratory of California Institute of Technology. When MSL launched, the program’s director was Doug McCuistion of NASA’s Planetary Science Division. The total cost of the MSL project is about US$2.5 billion. Reposting another Phil Plait piece. This one is totally mindblowing. There are times — rare, but they happen — when I have a difficult time describing the enormity of something. Something so big, so overwhelming, that words simply cannot suffice. The basic story is: Using the VISTA telescope in Chile and the UKIRT telescope in Hawaii, astronomers have made an incredibly detailed map of the sky in infrared. This map will help understand our own galaxy, more distant galaxies, quasars, nebulae, and much more. But what do I mean by “incredibly detailed”? This is where words get hard. So hang on tight; let me show you instead. Pretty, isn’t it? 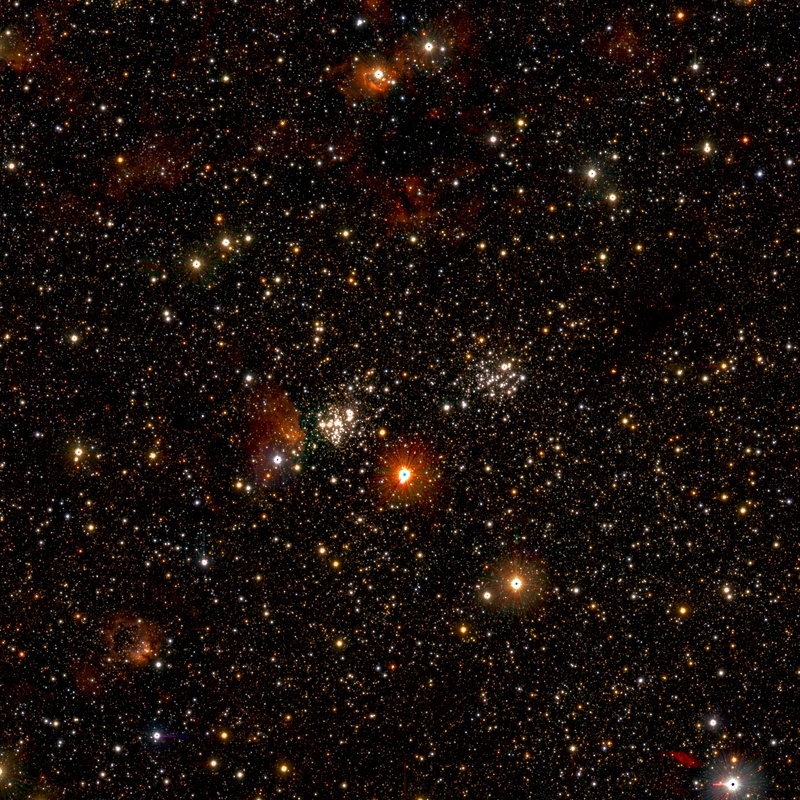 There are about 10,000 stars in this image, and you can see the gas and dust that’s forming new stars even as you look. Sure, I’ll admit that last one doesn’t look like much, squished down into a width of a few hundred pixels here for the blog. So go ahead, click on it. I dare you. If you do, you’ll get a roughly 20,000 x 2000 pixel picture of the sky, a mosaic made from thousands of individual images… and even that is grossly reduced from the original survey. How big is the raw data from the survey? Why, it only has 150 billion pixels aiieeee aiieeeeee AIIEEEEE!!! And this would be where I find myself lacking in adjectives. Titanic? Massive? Ginormous? These all fail utterly when trying to describe a one hundred fifty thousand megapixel picture of the sky. And again, why worry over words when I can show you? The astronomers involved helpfully made the original data — all 150 billion pixels of it — into a pan-and-zoomable image where you can zoom in, and in, and in. It’s hypnotizing, like watching “Inception”, but made of stars. And made of stars it is: there are over a billion stars in the original image! A billion. With a B. It’s one of the most comprehensive surveys of the sky ever made, and yet it still only scratches the surface. 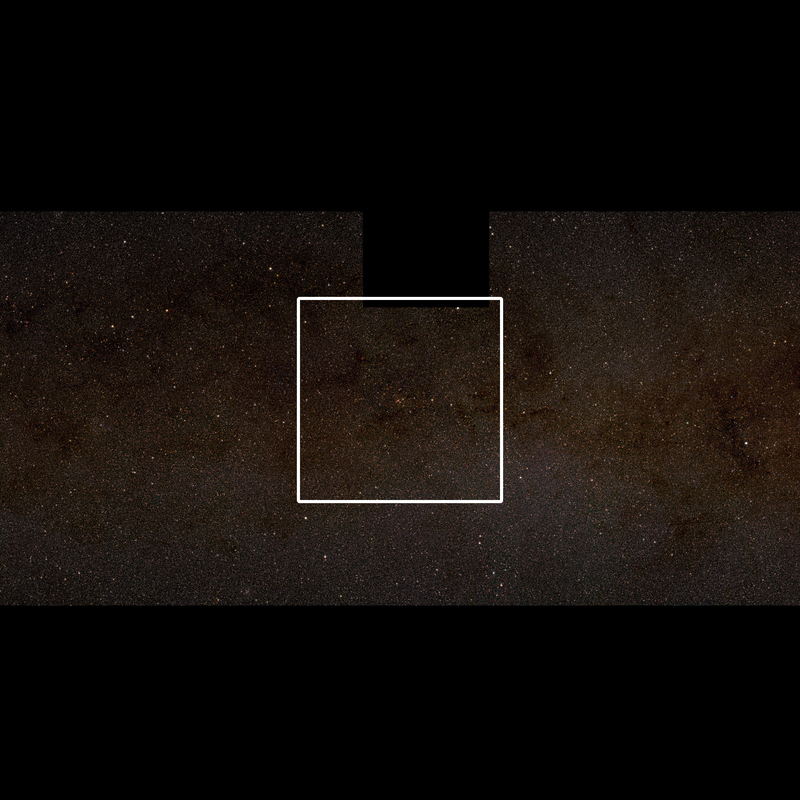 This survey only covers the part of the sky where the Milky Way galaxy itself is thickest — in the bottom image above you can see the edge-on disk of our galaxy plainly stretching across the entire shot — and that’s only a fraction of the entire sky. Think on this: there are a billion stars in that image alone, but that’s less than 1% of the total number of stars in our galaxy! As deep and broad as this amazing picture is, it’s a tiny slice of our local Universe. And once again, we’ve reached the point where I’m out of words. Our puny brains, evolved to count the number of our fingers and toes, to grasp only what’s within reach, to picture only what we can immediately see — balk at these images. But… we took them. Human beings looked up and wondered, looked around and observed, looked out and discovered. In our quest to seek ever more knowledge, we built the tools needed to make these pictures: the telescopes, the detectors, the computers. And all along, the power behind that magnificent work was our squishy pink brains. A billion stars in one shot, thanks to a fleshy mass of collected neurons weighing a kilogram or so. The Universe is amazing, but so are we. I could listen to Dr. Neil DeGrasse Tyson all damn day. THIS is why we invest in science. This. Every day — every single day, it seems — I see a note on Twitter, or get email, or hear someone on TV asking why we bother spending so much money on NASA. Billions of dollars! We should be spending that money right here on Earth! This argument is wrong in every conceivable way. Ignoring that we do spend that money here on Earth, ignoring that NASA’s budget is far less than 1% of the national budget, ignoring that the amount we spend on NASA in a year is less than we spend on air conditioning tents in Afghanistan, ignoring that we spend five times as much on tobacco in a year than we do on space exploration… this argument is still dead wrong. Because when we invest in science, when we invest in space, when we invest in exploration, we always, always get far more back in return than we put in. And not just in dollars and cents. See that picture above? It shows a new type of rocket engine design. Usually, fuel is pumped into a chamber where the chemicals ignite and are blown out the other end, creating thrust. The design pictured above does this in a new way: as the fuel is pumped into the chamber, it’s spun up, creating a vortex. This focuses the flow, keeping it closer to the center of the chamber. In this way, when the fuel ignite, it keeps the walls of the chamber cooler. One series of tests using empty houses at Vandenberg Air Force Base compared [this new] system with a 20-gallon-per-minute, 1,400 pound-per-square-inch (psi) discharge capability (at the pump) versus a standard 100-gallon-per-minute, 125 psi standard hand line—the kind that typically takes a few firemen to control. The standard line extinguished a set fire in a living room in 1 minute and 45 seconds using 220 gallons of water. The [new] system extinguished an identical fire in 17.3 seconds using 13.6 gallons—with a hose requiring only one person to manage. In other words, this new system put out a fire more quickly, using less water, and — critically — with fewer firefighters needed to operate the hose. This frees up needed firefighters to do other important tasks on the job, and therefore makes fighting fires faster and safer. There is no way you could’ve predicted beforehand that investing in NASA would have led to the creation of this specific innovation in life-saving technology. But it’s a rock-solid guarantee that investing in science always leads to innovations that have far-ranging and critical benefits to our lives. If for no other reason that’s why we need to invest in science: in NASA, in NSF, in NOAA, and all the other agencies that explore the world around us. It’s for our own good. And it always pays off. Astrophysicist Dr. Neil DeGrasse Tyson was asked by a reader of TIME magazine, “What is the most astounding fact you can share with us about the Universe?” This is his answer. Just some completely, insanely, amazingly incredible video. No big deal. Auroras, thunderstorms, city lights… how much are those Virgin Galactic seats going for these days? 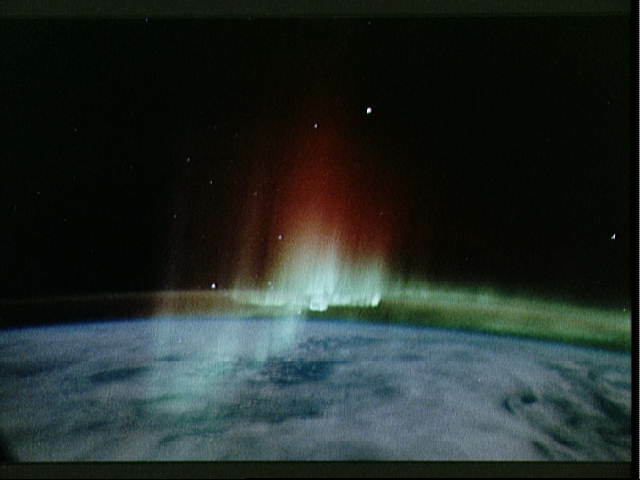 Shot from ISS expeditions 28 and 29 form August to October 2011. I guess this vid has gotten pretty popular lately. I saw it on the Vimeo front page a few days ago, and was even linked to it by my brother. 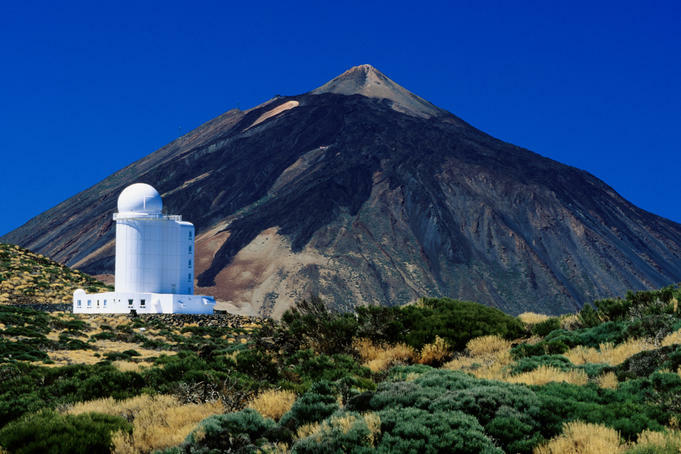 Spain´s highest mountain @(3715m) is one of the best places in the world to photograph the stars and is also the location of Teide Observatories, considered to be one of the world´s best observatories. A large sandstorm hit the Sahara Desert on the 9th April (bit.ly/​g3tsDW) and at approx 3am in the night the sandstorm hit me, making it nearly impossible to see the sky with my own eyes.